Silverlight has become a choice target for VXers who are foisting nasty exploit kits (EKs) on users through hacked advertising networks. Attacks targeting Silverlight have spiked since 23 April as attackers look for web platforms to target now that Java and Flash have cleaned up their acts a bit. Cisco lead threat researcher Levi Gundert (@levigundert) and his team reported the spike in attacks foisting the Angler exploit kit and said Silverlight had become the "drive-by flavour of the month" which would likely catch on as a trend in criminal circles. "Exploit kit owners are adding Silverlight to their update releases, and since 23 April we have observed substantial traffic - often from malvertising - being driven to Angler instances partially using Silverlight exploits," Gundert said in a research post. "We should expect these existing Silverlight exploits to proliferate through other exploit pack families in the near future as threat actors copy code from each other and release updates." The attacks through the unnamed ad network were largely successful going by "extensive" global DNS requests to Angler exploit kit landing pages detected by Cisco bods. A commendable 10 percent of unpatched victims were estimated to have been bagged in the attacks. Crims may enjoy lasting profit by popping Silverlight users Gundert said if Redmond kept to its life cycle to maintain the targeted version 5 until October 2021. Shifting cross hairs may yield better results for EKers as vulnerabilities in Adobe Flash and Java became fewer and more efficiently detected. There was also ample financial incentive to continue development as some exploit kits were thought to rake in more than $US30,000 a month to maintainers. Angler relied on Silverlight vulnerabilities patched in December and could also target unpatched Adobe Flash instances, and contained a dormant Java component that was not triggered. The trojan payload which opened a data slurping link to Brazil was foisted on victims using encrypted Silverlight or Flash exploits only after multiple web redirections. 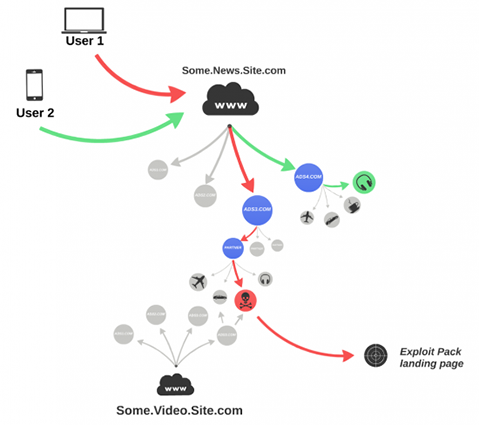 Cisco did not release the names of compromised websites serving the exploit kit but the use of Silverlight by online film factory NetFlix may have whetted the crims' appetite to migrate cross hairs to the platform. Yep, vulns of WannaCry infamy. Why haven't you patched yet?